A European Commission state aid notice published on March 23 has shown how EU member state governments can work directly against agreements they make at EU level, in this case on combatting climate change. The Commission said it would open an investigation into Estonian state aid that will underpin the construction of two highly-polluting power plants. The plants, to be built at Narva on Estonia’s border with Russia, will be fuelled by oil shale. This is, essentially, porous rock from which hydrocarbons can be squeezed. It presents many environmental problems. It produces more greenhouse gas than coal, and also poses a huge headache in terms of its mining and waste disposal. As this EU report says, “production of a barrel of shale oil can generate up to 1.5 tons of spent shale, which may occupy up to 25% greater volume than the original shale”. Oil shale is in any case a fairly crappy, low-grade fuel. The same report notes that “the heating value of oil shale is limited. In the best cases, it is comparable to that of brown coal or average forest residues, but less than half of that of average bituminous coal”. 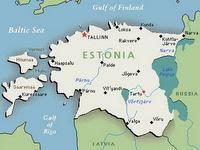 Estonia is pretty much the only country where electricity is generated on a big scale by burning oil shale. In fact, Estonia gets most of its electricity from burning this dirty fuel. Instead of weaning itself off oil shale, and diversifying into renewables, the Estonian government wants to give up to €75 million per year, for the next 20 years (so €1.5 billion) to subsidise more burning of oil shale and lock itself into highly polluting electricity generation well beyond 2020. This seems very shortsighted to say the least, especially from a government that has signed up to EU targets to reduce emissions by 20 percent by 2020 compared to 1990, and to increase the renewables share in the energy mix to 20 percent. But the Estonians are not the only ones undermining the EU’s climate goals. Should the subsidy be allowed to go ahead, the power plants in Narva will be built by Alstom, the giant French engineering company. And they will be doing so with French government blessing. France’s State Secretary of Economy, Finance, Industry and Foreign Trade, Pierre Lellouche was in Estonia to oversee the signing by state energy company Eesti Energia and Alstom of the contract to build the oil shale plants. Total contract size for Alstom (which the French state held a major share in until 2006, before selling it to another government favourite, Bouyges): €950 million. Lellouche said the contract would help guarantee Estonia’s energy security. At least he didn’t have the brass neck of Estonian Minister of Economic Affairs and Communications Juhan Parts, who said “the new energy units will give us [a] cleaner environment and greener future for our children”. Eh? Fortunately the Commission has stepped in and will investigate the state aid, but on the technical basis that it might create market distortions, rather than the common-sense basis that such aid for polluting industries is stupid and counterproductive. Let’s hope the Commission does forbid the aid.